by Alex Regalado & Caitlyn Young! "This Part of Me" by Alex Regalado and Caitlyn Young shows that with feminism, we are more than the sum of our parts. Here are our judges' Top 6 choices. Your vote will help us choose a winner! Another one of our favorite F words is... four thousand dollars. You could win this cash prize for your video entry, so make it good. Get your 15 minutes of fame. We will profile you on SheKnows.com and promote your video through our social channels. emmy-nominated actRess, star of "nashville" & "friday night lights"
writer, actress & video blogger on chescaleigh comedy & MTV's "DECODED"
Actor from "How to Get Away with Murder," "Orange is the New Black"
Tony Award-winning actress, from "supergirl"
Actress, star of "UnReal," "Girls," & "Roswell"
Make us laugh, make us cry, but make us feel something about #TheFWord: Feminism. Individuals who are over 18 and living in the US or Canada of all genders, ethnicities and points of view are invited to submit original two- to three-minute videos describing what feminism means to them. 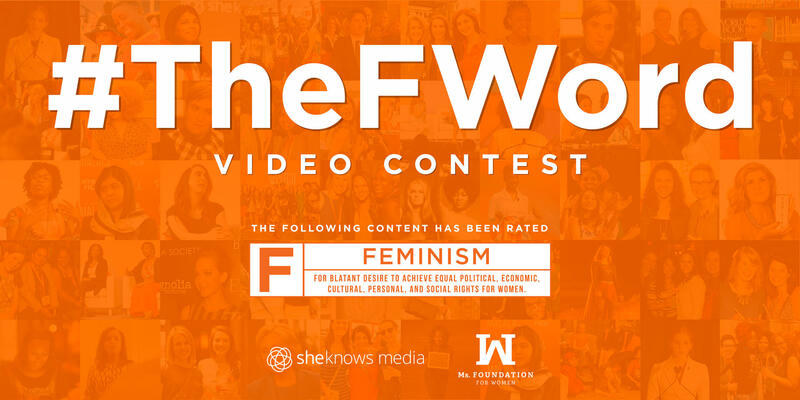 We partnered with the Ms. Foundation to launch this video contest and ignite conversation on feminism and intersectionality through the lens of powerful, personal storytelling. We'll be judging your video based on 3 main criteria: 1) Creativity, 2) Quality and 3) Originality. Entries can take any tone or use any storytelling format, but all should use good high-quality video and audio production. You should own the rights to any image, art or music that you use. Read more about this contest and the rules for submission here. You made us laugh, cry, and get all the feels over #TheFWord: Feminism. Individuals over 18 who live in the US or Canada of all genders, ethnicities and points of view were invited to submit original two- to three-minute videos describing what feminism meant to them. We partnered with the Ms. Foundation to launch this first-annual video contest and ignite conversation on feminism and intersectionality through the lens of powerful, personal storytelling. We are judging videos based on 3 main criteria: 1) Creativity, 2) Quality and 3) Originality. Entries could take any tone or use any storytelling format, but all needed to use good, high-quality video and audio production. Entrants needed to own the rights to any image, art or music that they used. At the People's Choice Awards on Jan. 6, SheKnows stopped celebs and asked them to weigh on #TheFWord.